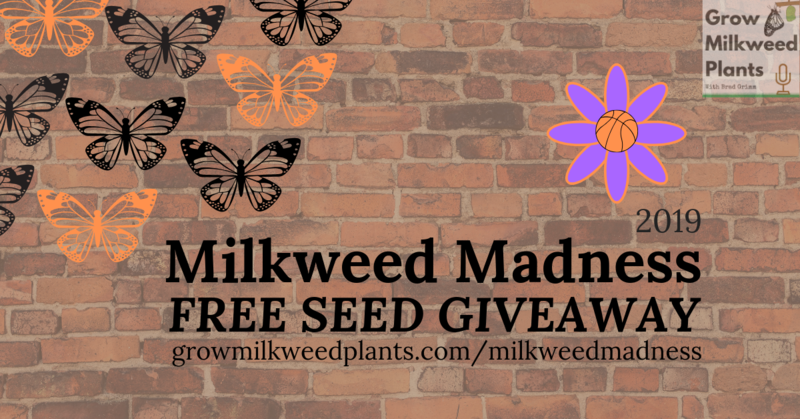 CONGRATULATIONS to the 2019 Milkweed Madness Free Seed Giveaway Champion "Asclepias Perennis"
How to win? You are assigned a Team and Milkweed at the beginning of the event. One team/milkweed will win the championship. Follow the progress of teams in the March_Madness_Bracket.pdf below or follow the progress of the milkweed in the Milkweed_Madness_Bracket.pdf below. If your assigned team/milkweed is the team that wins the championship on April 8th, 2019 then you have won. Milkweed Madness 2019 tracks the popular NCAA March Madness tournament. Milkweeds will progress through the brackets according to the teams they are mirroring in the real life tournament. Please keep in mind that the bracket presented on this site is in no way affiliated with the NCAA or any intellectual property associated with March Madness. Basic plastic cups, please recycle after use. Other prizes that will amaze you!